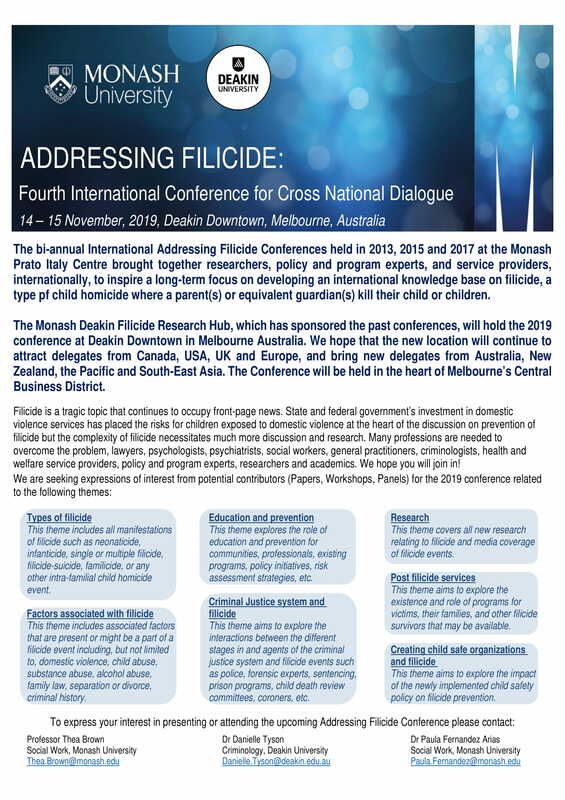 The Monash Deakin Filicide Research Hub is now calling for abstracts and welcomes contributions to the forthcoming conference across all disciplines including law, psychology, social work, criminology, criminal justice, general medicine, psychiatry, nursing, policy research, academic, governmental and non-governmental researchers, policy and program developers as well as from service organisations and victim advocacy and support groups. Explores the interactions between the different parts of the criminal justice system and filicide events such as police, forensic experts, sentencing, prison programs, child death review committees, coroners, etc. Any new research relating to filicide and media coverage of filicide events. Examines the existence and role of programs for victims, their families, and other filicide survivors that may be available. All manifestations of filicide such as neonaticide, infanticide, single or multiple filicide, filicide-suicide, familicide, or any other intra-familial child homicide event. Associated factors that are present or might be a part of a filicide event including, but not limited to, domestic violence, child abuse, substance abuse, alcohol abuse, family law, separation or divorce, criminal history. Explores the role of education and prevention for communities, professionals, existing programs, policy initiatives, risk assessment strategies, etc. Surveys the impact of the newly implemented child safety policy on filicide prevention. We would like to emphasise that other themes may present themselves to contributors that are equally as important as the ones below and we are happy to consider additional issues and themes. Abstracts should be 300 words long and include the title of the paper, the theme to be addressed, the authors’ names and addresses (postal and email), and organisational address (postal and email). You can also have a look at our keynote speakers. For any inquiries please fill in the form below and someone from our organising committee will get back to you as soon as possible.